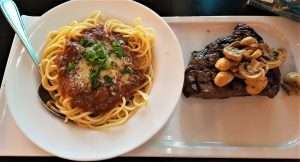 New York Strip Steak and Saucey Pasta. The spring green house tomatoes and mini cucumbers are making it to the produce department. 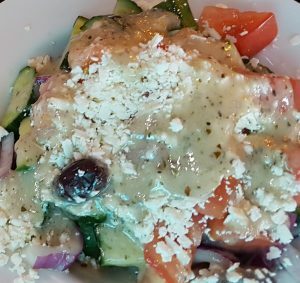 A good Greek style salad is the best way to bring out all those fresh veg flavours. A quick sauté of mushrooms in butter to season up the pan. Some ragu sauce, chili parmesan and some fresh blanched noodles. Seasoned with salt and pepper the steak was grilled at 550 degrees on the hottest grill part on the bbq. 3 minutes a side and let rest. Get out the beer and enjoy.